Outcomes of the International Scientific and Practical Conference “Eagles of Palearctic: Study and Conservation”. Elabuga, Republic of Tatarstan, Russia, 22.09.2013. Reintroducing the Osprey to Portugal. Palma L., Beja P., Dias A., Ferreira J., Mirinha M.
The Current Number and Distribution of the Osprey and the White-Tailed Eagle Nestings Groups in North West Russia. Babushkin M.V., Kuznetsov A.V. Current Status of the White-Tailed Eagle Population in the Don Delta, Russia. Markitan L.V., Dinkevich M.A. Steller’s Sea Eagle Monitoring at the Northern Part of the Sea of Okhotsk: Birds, People, Technologies. Potapov E.R., Utekhina I.G., McGrady M.J., Rimlinger D.
Results of Tagging Steller’s Sea Eagle Nestlings in the Northern Part of the Sea of Okhotsk (1993–2013). Utekhina I.G., Potapov E.R., McGrady M.J., Rimlinger D.
Twenty Years of Research and Conservation of Endangered Eagles in Portugal. Palma L., Beja P., Sánchez R.
Results of the Monitoring of Eagle Numbers in Belarus. Dombrovski V.Ch. On the Status of Stay and the Biology of Eagles in the Kharkov District, Ukraine. Viter S.G. 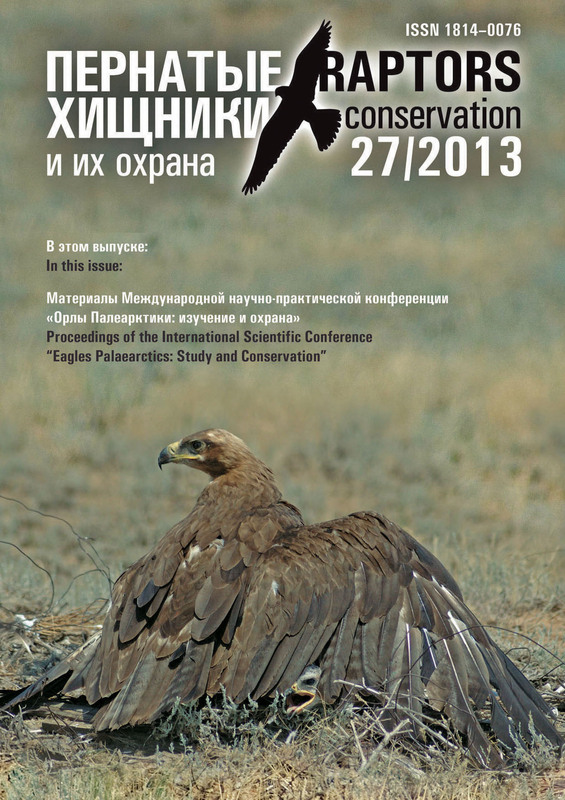 Monitoring Results of the Large Raptors in the Republic of Tatarstan in 2011–2013., Russia. Bekmansurov R.H., Karyakin I.V., Ayupov A.S., Kostin E.S., Rachmatullin R.F., Kutushev R.A.
Do Expectations about Golden Eagle Ecology Produce Reliable Guidance for Species Management? Walker D., Sheridan S., Burrows B., Cameron D.
Monitoring Results of Imperial Eagles Breeding Group in the Mountainous Part of the Altai Kray in 2013, Russia. Bachtin R.F., Vazhov S.V. On the Study of the Steppe Eagle in the Altai Kray, Russia. Vazhov S.V., Bachtin R.F., Barashkova A.N., Smelansky I.E. Distribution Patterns and Ecology of the Steppe Eagle in China. MaMing R., Zhao X. Distribution of the Steppe Eagle in the Indian Subcontinent: Review of Records from 1882 to 2013 AD. Pande S.A., Deshpande P., Mahabal A.S., Sharma R.M. A Study of the Time Budget of the Greater Spotted Eagle: How the Frequency of Observation Affects the Reliability of the Results, Belarus. Dombrovski V.Ch., Dmitrenok M.G., Pakul P.A. About Breeding of the Booted Eagle in the Lugansk District, Ukraine. Moroz V.A., Vetrov V.V. Large Raptors of the Ivanovo District. Melnikov V.N. On Some Examples of the Tolerance of White-Tailed Eagle in Relation to Man in the Southern Part of the Central Chernozem Region. Sokolov A.Yu. Eagles in the Altai-Sayan Region: Distribution, Numbers, Threats, and Trends. Nikolenko E.G., Karyakin I.V. Death of Birds of Prey on Power Lines in Daghestan. Gadzhiev A.M. The Scope of Death of Eagles on Power Lines in Western Kazakhstan. Levin A.S., Kurkin G.A. On the Way to Bird Safety on Power Lines in Kazakhstan. Voronova V.V., Pulicova G.I. Assessing Collision Risk in White-Tailed Eagles Using Laser Range-Finder Technology. Hulka S., Mcleod D., Larsen J.K.
Usage of UAV for Surveying Steller’s Sea Eagle Nests. Potapov E.R., Utekhina I.G., McGrady M.J., Rimlinger D.
The Russian Legislation Tightening the Sphere of Trapping and Turnover of Rare Bird in the Year 2013: Comments to Law N 150 FZ of 02/07/2013 and the RF Governmental Decret N 978 of 31.10.2013. Nikolenko E.G. The Project “Eagles of Russia”: Results of Eagle Ringing in 2013. Nikolenko E.G. Some About the Pallid Harrier Breeding in the Floodplain of the Ob’ River near Barnaul 2012, Russia. Ebel A.L. About Records of the Lammergeier and Himalayan Vulture in the Southeast Altai, Russia. Eshelkin I.I., Denisov A.V. Japanese Sparrowhawk in the Aldan River basin, Russia. Egorov N.N., Sleptsov S.M.